Recently there was a series of “Who is Irish Game Dev” polls in the IrishGameDev facebook group which had some interesting results. For me the most interesting was the “Where is Irish Game Dev?” which asked everyone in the group to select the province in which they work. This data was used to create a pie chart that showed the percentage of total count spread across each location. For this article I will use a bar chart to represent the data as I believe it has more impact. This helps us get more of a sense of who is in IrishGameDev. This data represents the respondants to the survey which comes in at 168 out of 2,266 (13.488%) total group members. Specifically, this is survey of the game developers involved in Irish Game Development who are engaging with social media. There are likely marketing terms for this that I am unaware of, so feel free to use that in your head. This cohort of people have given themselves time for checking their feed and doing a quick second survey for the benefit of the group. While it’s not at all a survey of the game development industry in Ireland as a whole, at the time of writing I am currently willing to take it as a generally indicative slice of the wider state of things. With that in mind I would like to draw your attention to the population statistics for each region. As a developer in Galway (Connacht) I can’t help but be aware of the differences in population for these regions. Let’s use this population data with the survey results to make a Irish Game Dev respondants location per capita chart. For the purposes of this chart I will dispense the “Not in Ireland” result. Wow. Did you notice the chart change? I know it might seem odd to give such small numbers in context to the overall population of the Republic of Ireland and Northern Ireland combined, but I believe we learn something quite valuable hidden within this context. There is a greater percentage of Connacht based Irish Game Developer respondents than any other region in North and South of the island. Huh? I know game dev is known for being a tough industry, but locating yourself on the frontier of the Atlantic ocean seem’s like there’s folks who are seeking a tough life! From this data I suggest that individuals from the game development community within Connacht are likely working out of Galway city, the largest urban centre in Connacht. I also interpret from it that Galway likely has the highest game developer per capita ratio in Ireland. Some hoops I’m jumping through so let’s have some fun. 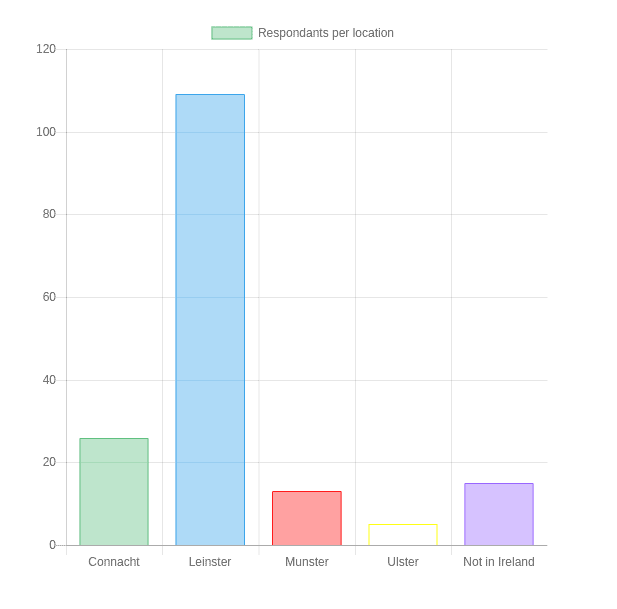 There seems to be a lot of respondents per capita from Connacht compared to Leinster. They seem generally more engaged than other regions because of this. Do Connacht-based developers feel a greater obligation to add their voice to such things – to be counted among game developers in Ireland? I’m would assume that is the case, since game development industry in Ireland is centered around Dublin, Irelands capital. There is a notion of Dublin-centric bias in Ireland. As the capital city it comes as no surprise. However it seems that folks outside of Leinster seem to speak much louder than their Leinster based counterparts. It seem’s as though it’s a notion that has become internalized in the rest of the people in the country. A notion that if something didn’t happen in Dublin then it didn’t really matter all that much. It’s kind of sad and disheartening, which is why I find numbers like those above to be quite encouraging. There’s a lot written about that Dublin-by-default thinking and I suppose it’s outside of the scope of this tiny blog post. Ultimately there are things happening in Ireland. We’re making indie games, mobile games, larger games, game technologies and conducting academic game research. At least 13.4% of the people involved in the Irish Game Dev group chat are interested in helping each other out with understanding it. That’s 168 people. That’s a lot of help for anyone who thinks they are struggling to make games on this island and want some feedback. Please use it! Add your voice to the discussion, ask for help, give advice from your experience. Let’s be supportive and continue to grow. If you have any insights or comments please leave them below! I have no insights really, but the stats are new and interesting to me. I really want to figure out a way to move to Galway and work.. le sigh..
It’s a nice spot, to be sure! I reckon that it’s probably going to continue being a home for small studios, with only a couple of exceptions cropping up. Larger population centers pose less risk for larger companies who want to invest in a location with an already flourishing talent pool. I believe Galway is growing, but is still in it’s early stages. It is clear to me that the Irish Government has many options to grow the industry here, and isn’t taking any steps forward. The Gaming industry is the largest entertainment industry in the world (larger than film, larger than music) so it’s a wonder why the government is loath to fund it. I heard an accout of a game developers, while pitching for some fund in Ireland also had to explain to the funding body what the gaming industry is, and that their idea wasn’t ‘just a toy’. That problem comes from bundling game development with tech. In a country with a lot of med-tech and fin-tech industry I’m sure that any funding body worker hearing a game pitch would react similarly, contorting their face at such a bizarre proposition. Game development, while very tech-oriented, is likely more linked to Film and Animation in terms of up-front costs and the creative process. It makes more sense to me to have some experts within the Irish film industry work closely with any funding bodies interested in developing the games industry in Ireland.